Welcome. This is my line of high end iambic & single lever paddles and keys. Incorporating old school looks with new school technology, they feature ball bearing movement, magnetic lever return,solid silver contact points and quick adjusting fine thread stainless steel contact and magnet screws. Along with short lightweight aluminum lever arms and the correct geometry, these paddles offer an excellent and responsive feel, making QRQ (or QRS and anything in between) operation effortless. Also available is high performance ZN-MiniMITE iambic paddle, ZN-V/45 and ZN-M45vt (45 degree vertical paddles) & the ZN-HK and ZN-HKII straight keys using 4 ball bearings, spring for return, stainless steel screws and silver contacts. The iambic paddles are available in 3/8", 1/2", 5/8" or 3/4" OTO - see OTO options for more details. These are fixed parallel arm arrangements. Measure your favorite key's OTO and order accordingly. The ZN-MiniMITE, ZN-M45vt, ZN-9Z & ZN-9RZ have the 3/8" and 5/8" OTO options. 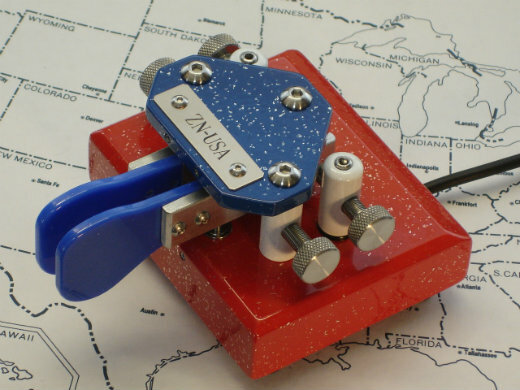 The ZN-9, ZN-9A, ZN-QRP & ZN-V/45 have the 1/2" and 3/4" OTO options. Fingerpieces are Lexan Polycarbonate. The ZN -SL and ZN-SLjr represent the single lever paddles. Using two Lexan fingerpieces, the OTO for the single lever paddle is 3/8". The ZN-HK & ZN-HKII are the straight keys using 4 ball bearings and solid silver contacts. Check out the ZN-MiniMITE - high performance stand alone mini iambic paddle.